*This article was originally published on NCTB’s website. Across the road, hundreds of cows are seen. Surrounding the park is a long field of almond trees, and then, there lies the Backyard Ballpark, in Turlock, Calif. There is an old sandlot feel with modernization as well. Only one baseball field is there with two burgundy barns on each side of the field. 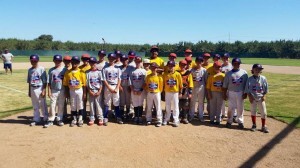 Here, NCTB’s 11-U Team NorCal prepared to get ready on Aug. 23-24 before they left for the National Team Identification Series in Cary, N.C., to get a chance at making the 12-U Team USA baseball team. The entire roster for the players participating can be seen here. Wearing Team USA hats with hopes of representing our country, the boys had a strenuous day of practice and testing on Saturday. After playing catch with instruction by coach Sean Riley, individual groups were formed with practice and instruction from coaches. Coach Riley worked with the infielders, placing them at shortstop for different drills. The players worked on balls in the hole and to their backhand side with Riley going over all the proper footwork. Lamorinda’s Davis Diaz, a returner from last year’s NTIS team, showed exceptional footwork and knowledge of the game at such a young age. Adam Farb took the catchers through receiving drills, blocking, and footwork drills. Griffin Allen, who played for the 12-U Team USA last year, had the top catcher pop time for the 50-70 field with a 1.97. Eddie Madrigal, cousin of past Team USA shortstop and Oregon State commit Nick Madrigal, threw a 2.03, and usual outfielder Dante Bellistri threw a 2.19. Jim Sammons took the boys through outfield drills during individual time with Blake Burke having the top outfield velocity of 66 miles per hour. Bobby Blanford was closely behind at 64 miles per hour. After individual work, the team took the field for Infield and Outfield twice with coach Riley hitting to the players. Coach Farb emphasized enthusiasm and hustling as hard as possible. Carson Crawford, who can play a plethora of positions showed a strong arm, translating to the top infield velocity of 63 miles per hour. Davis showed his quick hands again, turning double plays in a flash. The boys then took a break from their gloves and made their legs do the work. They were tested in the 5-10-5 shuttle and a 30-yard dash. Perhaps the kids’ favorite part of the day happened after being tested. They took to batting practice showing off their swings and power. In the first group, Allen showed his power stroke as he blasted three balls on three swings over the left and left centerfield wall, deep into the almond trees. Allen had a handful of long balls during batting practice on the day. Besides Allen, Burke, Diaz, and Madrigal displayed their advanced swings with occasional power as well. In Little League there is no leading off, but in 50-70 there is and base running is a key component. After BP, coaches went over both leads and secondaries at each base. Coach Riley showed the young guns how Santa Clara University taught base running at second base, already giving the boys a leg up from some collegiate experience. Riley took a group over to first base for a coaching session, coach Vince at second base and Farb went over third base. A needed lunch break was then upon us in the 93 degree weather, and instead of pure rest, the boys decided basketball in the barn of the third base side would be their break. Let’s just say these guys are going to NTIS for baseball for a reason. Griffin threw up a shot that nailed the indoor lights and the nets caught fire thanks to coach Sean Riley… well, according to him. The final stages of preparation on Saturday saw the pitchers work on pickoffs at both first and third base. Catchers also got work in with pitchers, doing pitch outs and making sure they throw far enough outside for both left and right handed batters. To finish out the day, swings were again put on display to get ready for Sunday. Saturday was full of preparation. The boys practiced to perfection, and now Sunday they could feature their skills in games. Team NorCal played two seven inning scrimmages against some of the best 12 year olds in the surrounding area. Team NorCal scored its first run off of TJ Smith, a team alternate, on a Madrigal base hit to centerfield to bring in Antonio Cabrera. Burke scored on a walk to Davis and while the scrimmage had a rule of no more than seven batters in an inning to preserve arms, Blanford was hit by a pitch as the last batter, that would have also scored a run. Allen started on the hill showing his impressively strong arm from the get go. He hit 69 miles per hour as the top arm for the day. Besides the fastball, Allen also had a solid curveball and change-up to keep hitters off balance. Foley started off the second inning with a line shot right over the center fielder’s head for an easy double. The double was the first of six hits for Foley on the day, who said he felt very confident at the plate. Four of his six hits came in the first game. Two more runs were scored in the inning on a Burke line drive to left field that went right by the third basemen and scored Foley and Shorts. Allen missed a couple pitches high, but proved to be too over-powering and threw two scoreless innings on the day. Madrigal nailed a runner at third base for the final out of the inning. Griffin will be going to the NTIS for his second straight year after making Team USA last year, but has an interesting favorite part of the event. “The flying,” Allen told me when asked what he is most looking forward to. Foley struck again in the third inning with a sacrifice fly to right field that scored Diaz. Blanford also provided another RBI by blooping a ball in between the center and right fielders, plating Haskins. Blanford also pitched his only inning with a few control issues, walking in two runners. NorCal’s shutout was over, but the offense did not stop. Four more runs came across the plate, as the bats continued to stay as hot as the sun bearing down on the players. The returners of Allen and Diaz both smoked balls to the outfield with Allen scoring Burke, and then crossing home himself from Diaz. Madrigal had a great read on a passed ball and hustled his way to a run. The Foley show continued with an RBI ground ball, bringing in Diaz. Walczykowski came in to pitch in the bottom half of the fourth and was helped by a sweet one-hop snag from Crawford at third base. Team NorCal’s own Ryan Dority broke up the no-hitter for the other team with a liner off of Walczykowski. Rodriguez joined the scoring barrage with a shot to right field as Crawford and Bellistri scored. Diaz then knocked Rodriguez in and came around himself with a hard ground ball by the five-hole off Blanford’s bat. Walczykowski pitched his second scoreless inning in the bottom of the fifth inning. Team hitting was seen in its finest form in the top of the sixth inning. Werner and Crawford both hit back-to-back fielder’s choices for RBIs to the second baseman. Walczykowski then brought his skill from the mound to the plate with a base hit to right field, scoring Rodriguez and Bellistri. Davis, the usual middle infielder, took his shot on the mound and didn’t give up a run in his first inning. For his grand finale of the game, Foley hit a screamer in the five-hole, to finish the game four-for-four with a sacrifice fly. Haskins and Bellistri also added more RBIs to their stat sheet in the final inning of the game. Diaz gave up his only run in the last inning of the game. After a half-hour of lunch, the boys were back on the field for one last scrimmage. Crawford went from the field to the mound to start the game, and went three up and three down in the first inning. Jacob Wright, an alternate, started against Team NorCal and was plagued by errors, giving up four runs in the first inning, but all by errors. Crawford pitched his second scoreless inning in the top of the second, highlighted by line drives caught by Diaz at shortstop and a liner right back at Crawford himself. The first of Foley’s two hits in the game was a hard ground ball to left field that scored Rodriguez. Rodriguez, a jack-of-all-trades utility player, took his talent to the mound in the third inning, and gave up one run. Foley showed he can do more than just hit and saved Rodriguez of another run by gunning a runner out at home plate on a rocket throw from right field. After pitching to perfection, Crawford then executed a hit and run perfectly and plated Madrigal. He then scored on a base hit by Rodriguez. A missed catch on a double-play attempt brought in a run, but Foley got the team a run back in the bottom half of the fourth inning. He led the inning off with a double that one-hopped the left field fence and scored on a blooper off of Madrigal’s bat. After his six hits, Foley took to the mound for one inning in the fifth, and only gave up one unearned run. Team NorCal answered back with Cabrera scoring from a fielder’s choice. Burke came in to pitch a scoreless sixth inning, but the boys couldn’t get him any run support either in the inning. He then gave up two runs in the seventh, but the boys wouldn’t keel over in the bottom-half of the last inning of the day. Shorts started the inning off with a walk and then used his speed later to steal third base. Three runs crossed the plate, one by Burke after getting hit by a pitch, while Allen and Madrigal scored on passed balls. The two days of preparation were long, productive days for the boys to get ready for the NTIS. They showed constant enthusiasm and a willingness to learn from the coaches. Events for the NTIS begin on Thursday in Cary, N.C., at the USA Baseball complex.